The mist glides across hundreds of towering, sandstone pillars topped by trees before plunging down into the green-swathed ravines below. A verbose description of Zhangjiajie's scenery will never quite do the place justice, perhaps this is why the area is such a popular filming and tourist destination. Lying on the border of Hunan, the main draw is the Wulingyuan Scenic Area, which was declared a UNESCO World Heritage Site in 1992 and is made up of the Zhangjiajie National Forest Park, Suoxi Valley, Tianzishan mountain ranges and Baofeng Hu. 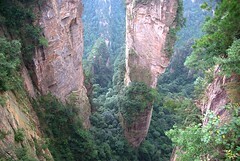 Avid hikers and nature lovers flock to Zhangjiajie explore the mountains, caves and forests of the area, enjoying one of China's most famed landscapes. While Zhangjiajie is most known for its unusual sandstone pillars, its caves with their numerous stalactites, underground cataracts and rock formations are also impressive: Huanglongdong and Longwangdong are both worth a visit. The wildlife in the National Forest Park is one of the main draws: giant salamanders, rhesus monkeys and golden pheasants are among the usual suspects you might stumble upon. And if you are not the hiking type, access to many of the mountains and caves has been made easier with paved paths.